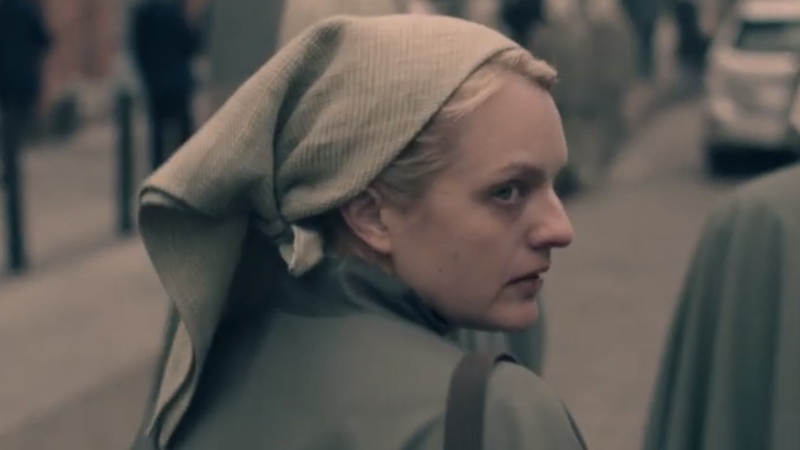 In between mermaids selling spiked seltzer and the Backstreet Boys singing about Doritos, a much more somber ad made its way into the highly anticipated roster of Super Bowl commercials: a preview for season three of Hulu’s The Handmaid’s Tale. At first, the commercial seems innocuous. Optimistic, even. “It’s morning in America. Today, more women will go to work than ever before in our country’s history. This year, dozens of children will be born to happy and healthy families,” a voice says. Images of the women of Gilead — including Serena caring for June’s daughter — show what appears to be a softer side to Margaret Atwood’s dystopian reality that fans of The Handmaid’s Tale have grown accustomed to. But make no mistake: it gets dark fast. Fans will recognize the handmaids, who are enslaved as child bearers, getting ready for work. And then the words “It’s morning again” begin to serve as an ominous refrain, repeating as more apocalyptic images begin to flash: spreading fire, an irate Commander Waterford, women at the irradiate Colonies and June (aka Offred) ready for war. “Wake up, America. Morning’s over,” she says as the teaser trailer shows a throng of handmaids standing in front of the Washington Monument, which has been fashioned into a giant cross. The entire trailer borrows from a well-known 1984 political ad in support of Ronald Reagan’s presidential reelection bid. Titled “Prouder, Stronger, Better,” that older commercial is echoed in the Handmaid’s Tale teaser through music and the baritone narration. Fans watching the Super Bowl seem to dig the new, more rebellious direction June is headed. The Best ad of the first quarter of the Super Bowl goes to the Handmaid's tale, borrowing from Ronald Regan's famous 1984 re-election campaign ad. Loyal viewers (*raises hand*) undoubtedly look forward to finding out whether or not June’s big sacrifice pays off. At the close of last season, she opted to stay behind in Gilead despite being rescued. Although it appeared she got her newborn to safety via Emily, June felt compelled to face life as a handmaid in order to be close to — and presumably try to save — her older daughter, Hannah. This much seems clear from the teaser trailer, though: June’s path will be filled with danger.